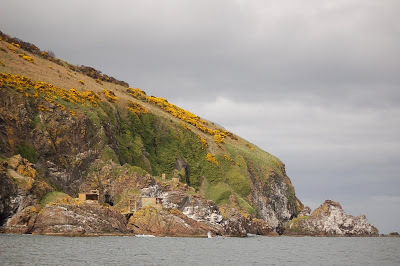 Having read Cameron McNeish's description of the Moray Coastal Trail in the Scots Magazine, a two-day coastal daunder from Forres to Cullen (or vice-versa), we were keen to see it for ourselves. 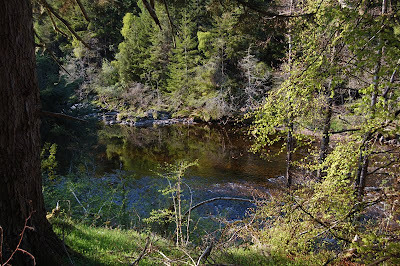 Rather than doing the entire walk, we walked a taster from Lossiemouth to Findhorn. I don't know if this is the best bit of the trail, but it was certainly eye-openingly beautiful, a blazingly sunny day helping the seaside mood. Directly on leaving Lossie, a broad, pure beach leads to the Covesea lighthouse, perched on a low cliff-punctured crag above sand-dunes and links, hosting the ubiquitous golf course. We stopped for a sunbathe and bite to eat, a big yellow helicopter buzzing about just offshore. I waved at the pilot - wonder if they waved back? After Covesea light, the path climbs up onto cliffs as far as Hopeman, tumbling masses of gorse falling over the crumbling edges, gulls on sea-stacks, with cliff-riddled headlands and rocky foreshores constrasting with gorgeous, inacessible beaches. Don't you just want to find a way down to this beach and share its limpid waters with the gulls? 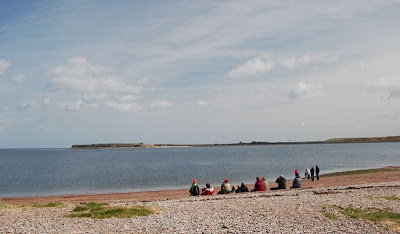 On such a warm day it was a relief to reach Hopeman and have an ice-cream and top up our water supplies. But there was a fair way to go yet. Burghead was next - but on the way to Burghead, the highlight of our entire holiday occured. The way to Burghead is less spectacular than the previous stretch, mainly walking along the bottom of an old railway cutting. 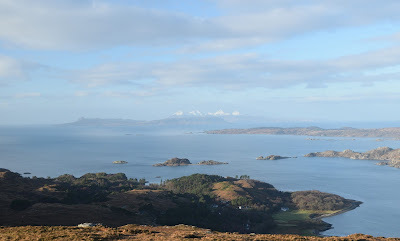 But occasionally it opens out to the sea - and what was that out there? A pod of feeding dolphins, surrounded by gulls! If only I had a long lens to show you! 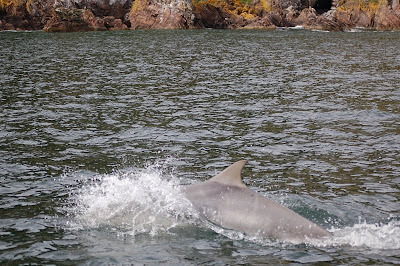 There must have been over twenty dolphins, and my heart skipped a beat as one of them, then two simultaneously, leap entirely clear of the water in a display of joyous athleticism. 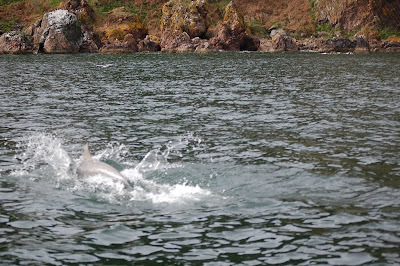 We had paid for a boat trip a couple of days before to go out to see dolphins from Cromarty, but hadn't seen anything like this! Burghead is a pretty wee town, with fascinating Pictish remains: and we finished the day, sun and weather-beaten, in Findhorn, where we were staying the night. I haven't had as much fun on a day's walk for a very long time. 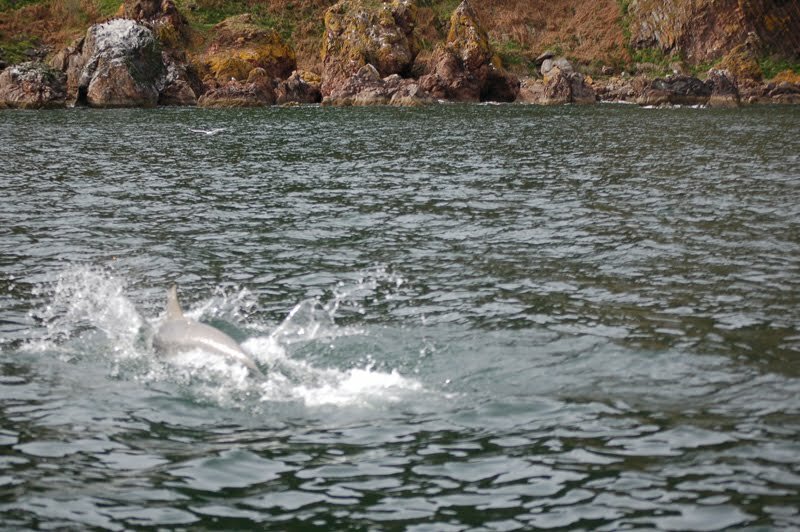 When you are near the Moray Firth, one of the things you should try to see is the pod of dolphins that inhabits this stretch of water. They are the biggest dolphins in the world apparently - bulky due to the fat reserves demanded by their chilly northern home! 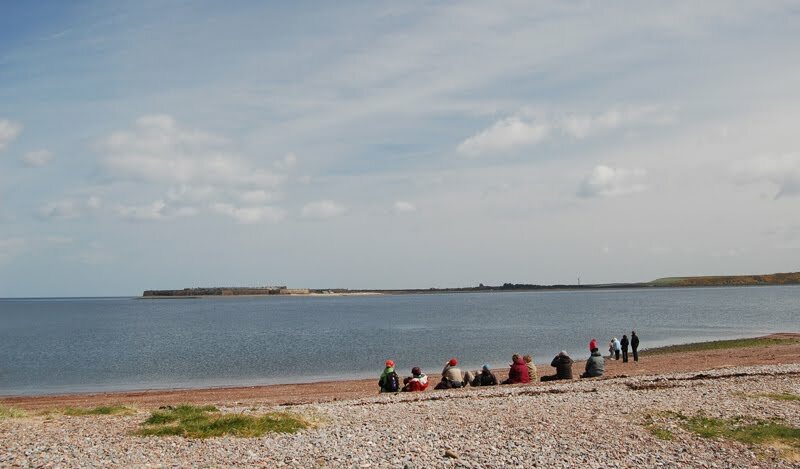 We were told that the best place on land to see dolphins was from Chanonry Point at high tide, where the Moray Firth narrows between two spits of land (the other is Fort George, opposite Chanonry Point). 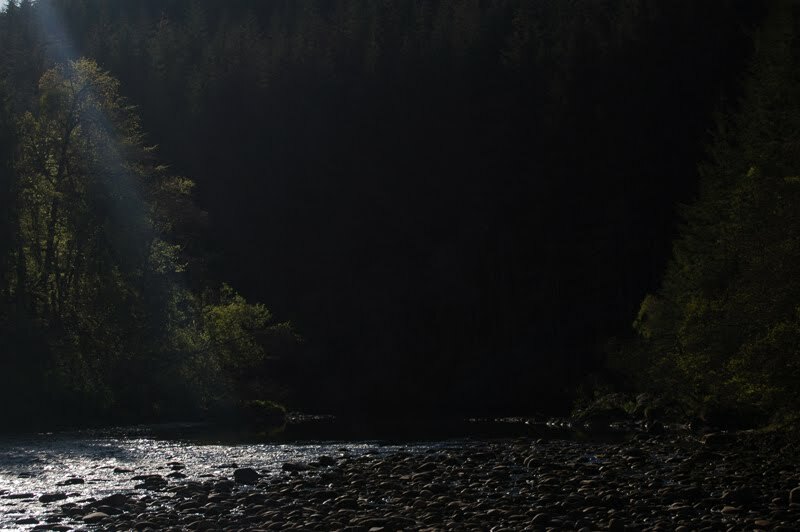 In atmospheric evening light we wandered down to the lighthouse, water rushing silent and smooth past the point, a view down the fault line towards Loch Ness, the lighthouse lamp starting to wink. An Indian couple were also strolling about. 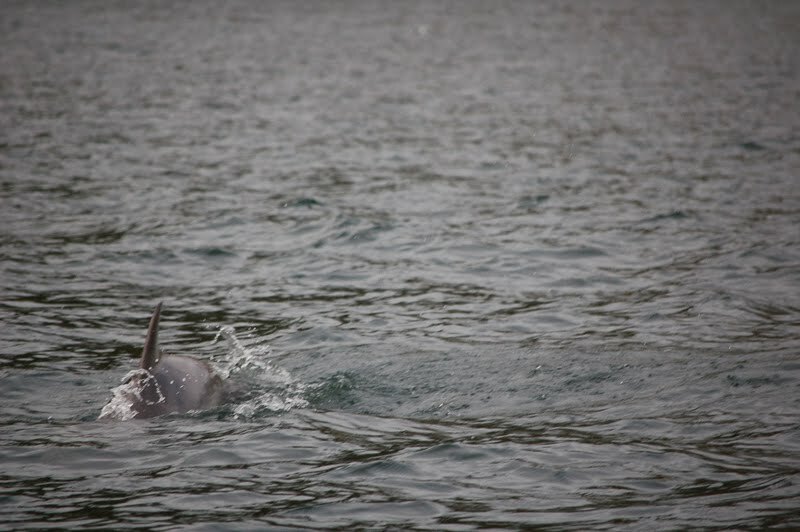 "Bottlenose dolphin!" 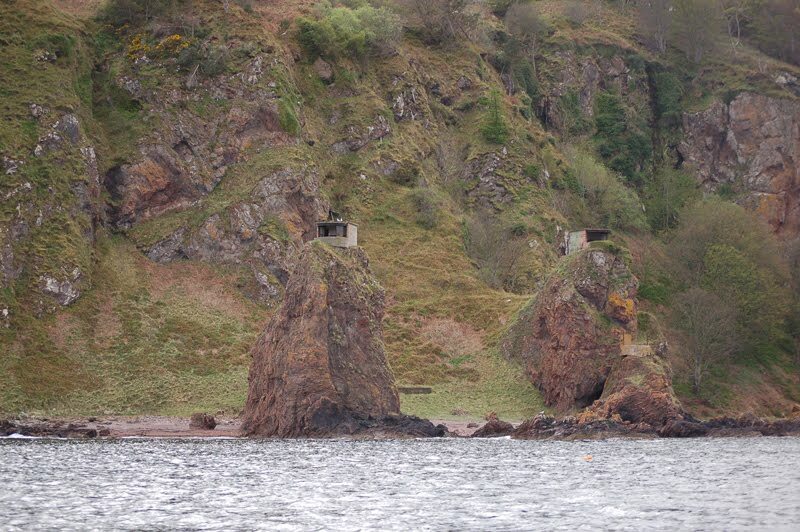 exclaimed the man excitedly, pointing to a dog-like head just offshore. 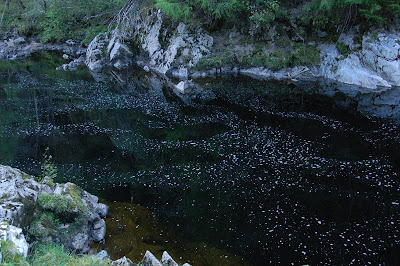 The next morning we returned, but it was too late in the day: the tide was right out. A nice spot for a picnic however, and there were plenty dolphin watchers in attendance. The only thing to do if we wanted to see dolphins was to take a boat trip! 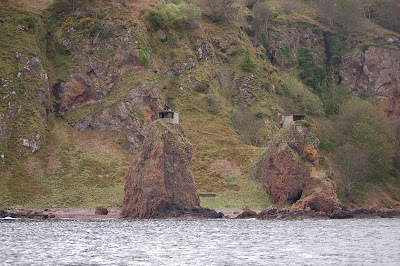 A trip to Cromarty and a boat ride with Ecoventures was on the cards. First, our captain Sarah drove the RIB into the Cromarty Firth, close to old rigs that rest in Nigg Bay, either awaiting breakup or redeployment elsewhere. 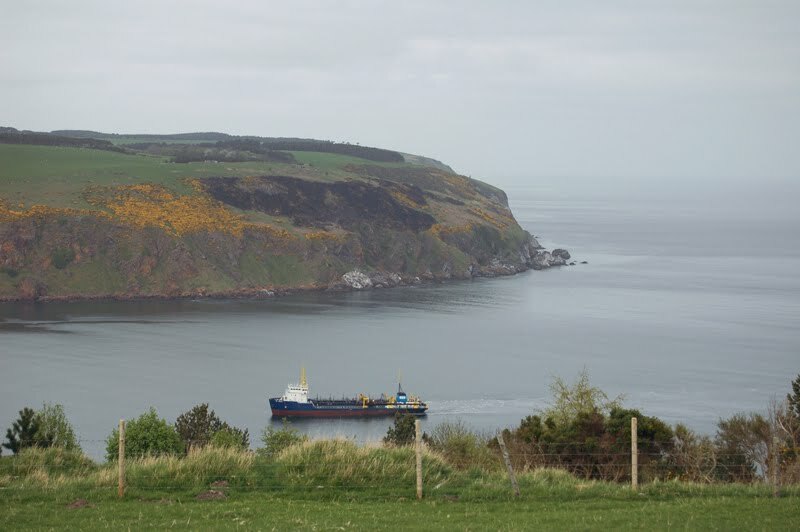 No dolphins here, so we went out through the narrow channel between the headlands of North Sutor and South Sutor and into the Moray Firth. 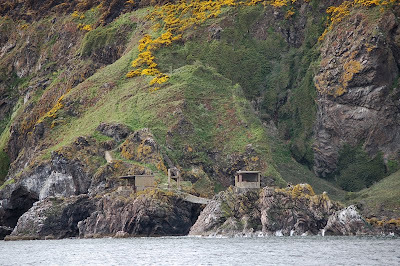 The North Sutor has a rocky and inaccessible coast, home to many seabirds, and old lookout stations from the 20th century wars. But no dolphins. But then we saw them! 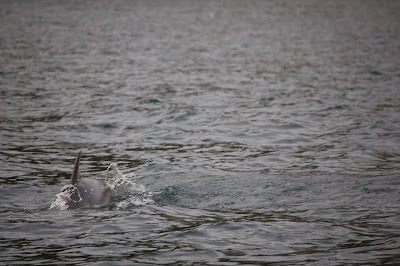 Engine at idle, we drifted along as a group of three feeding came close to inspect us. Two were adults and one was a baby, its stretch marks still showing. They are not easy creatures to photograph! After seeing the dolphins we headed back to Cromarty, and we explored this beautiful little town, walking up to a viewpoint on the South Sutor. 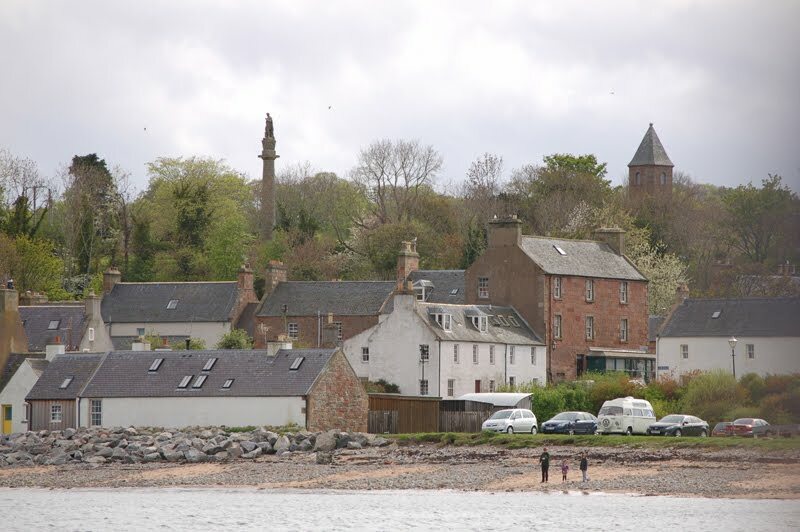 Cromarty has been a prosperous little town for a long time, and was the base for the King's Ferry. 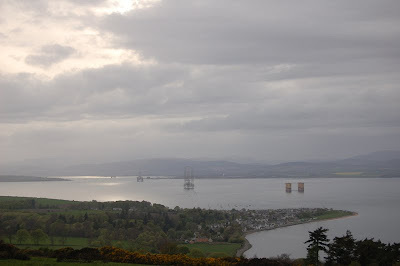 This northern counterpart for the Queen's Ferry over the Forth was first mentioned during the reign of William I, but possibly dates back to Pictish times. 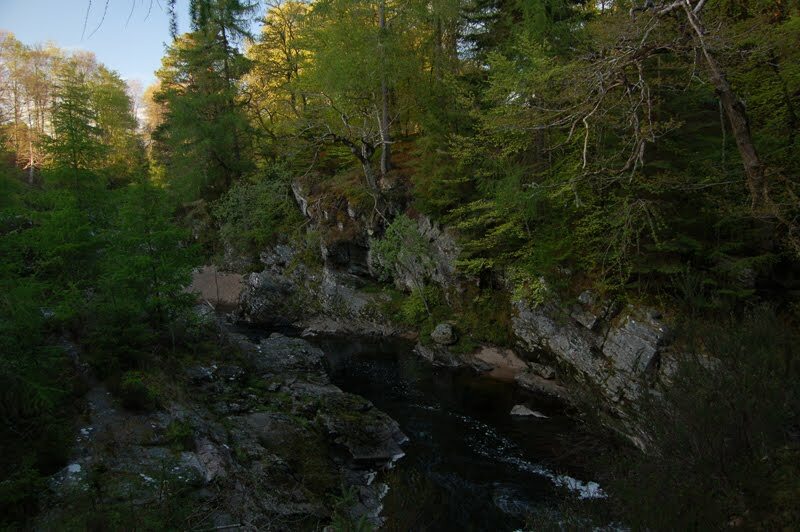 Its most celebrated passenger was James IV, a regular pilgrim to the shrine of St Duthac at Tain. 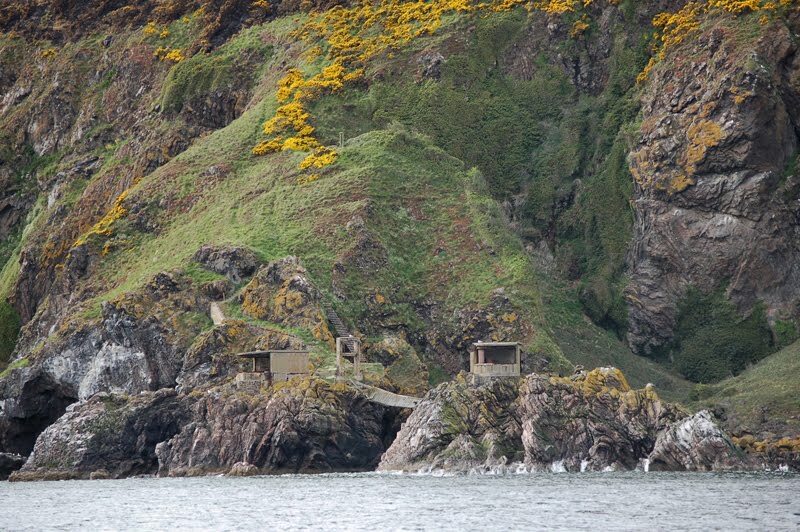 This peninsula between the Cromarty and Dornoch Firths is a little-visited area, but one for another post! 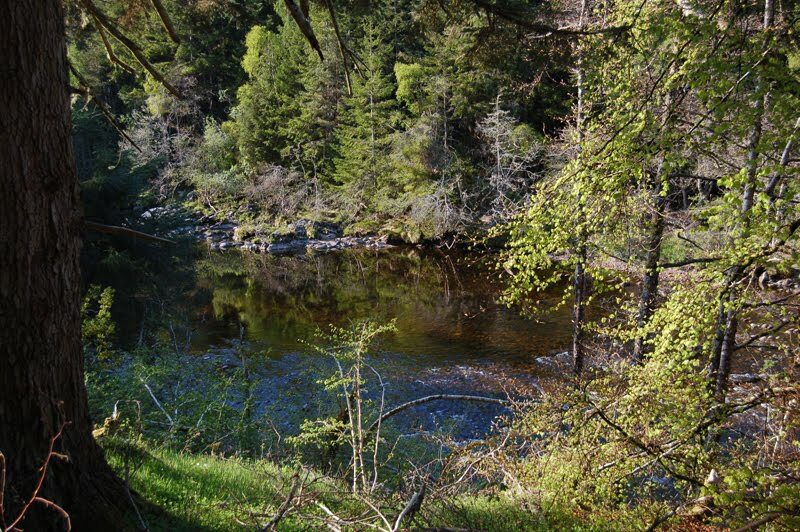 After a day in the open air we were glad to get back to Cromarty and find the Sutor Creek Cafe. 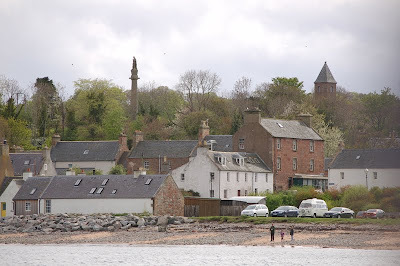 Cromarty is a great place and we will surely be back! 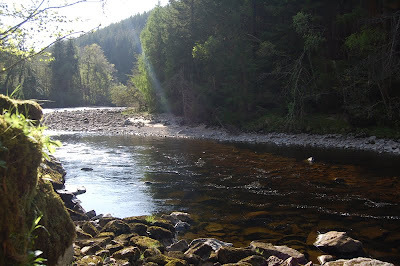 Since reading Jamie Whittle's book White River, I've been keen to visit the River Findhorn, especially since realising it lies on the same fault line as the Etive-Taynish gap on my preferred Coast-to-Coast walk. 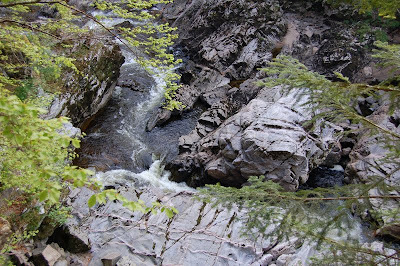 A recent trip to Randolph's Leap enabled me to fulfil this ambition. 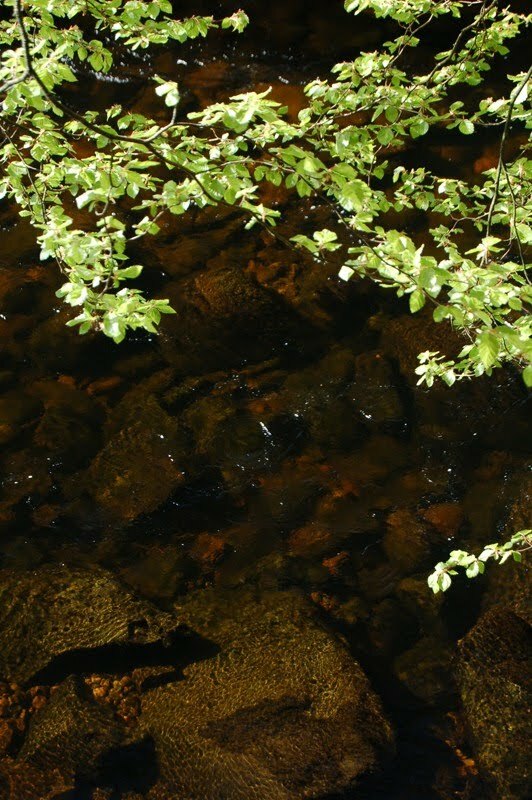 The first thing that struck me, apart from the beauty of the general situation, was that the river was not so much white as dark. Very dark. 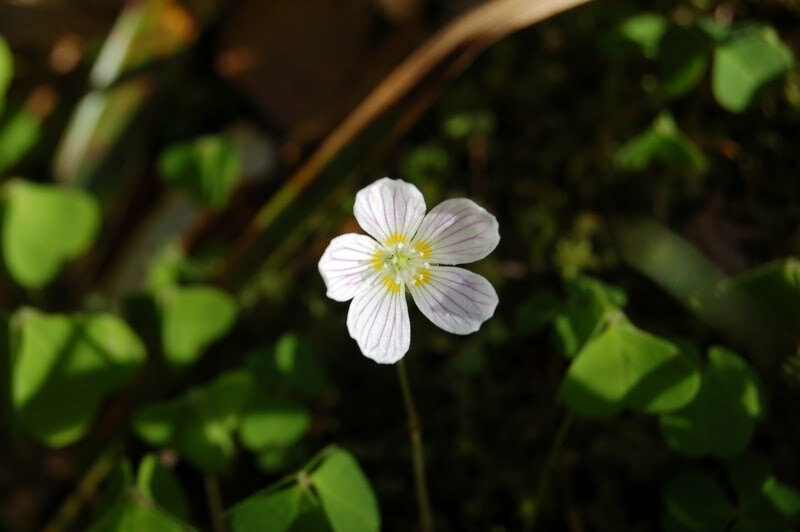 As we walked upstream the sun came out, shafting light onto dark pools and illuminating the woodland flowers like wood sorrel. 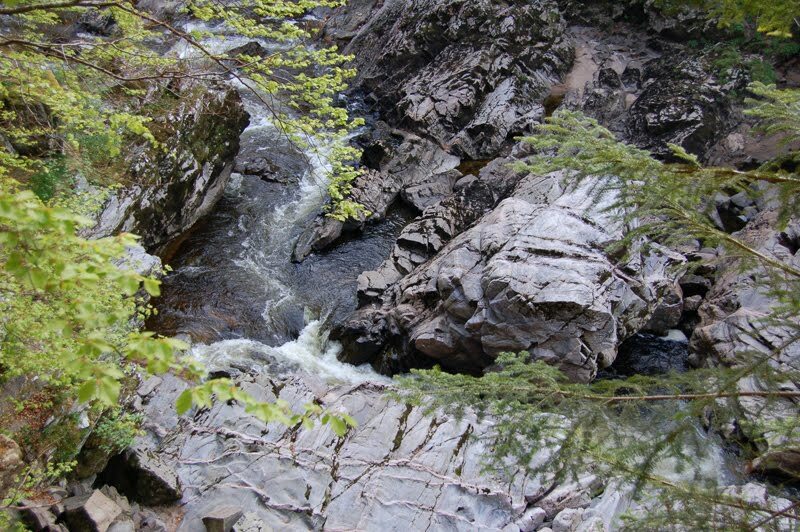 Randolph's Leap is a lovely beauty spot. Why is it not famous? 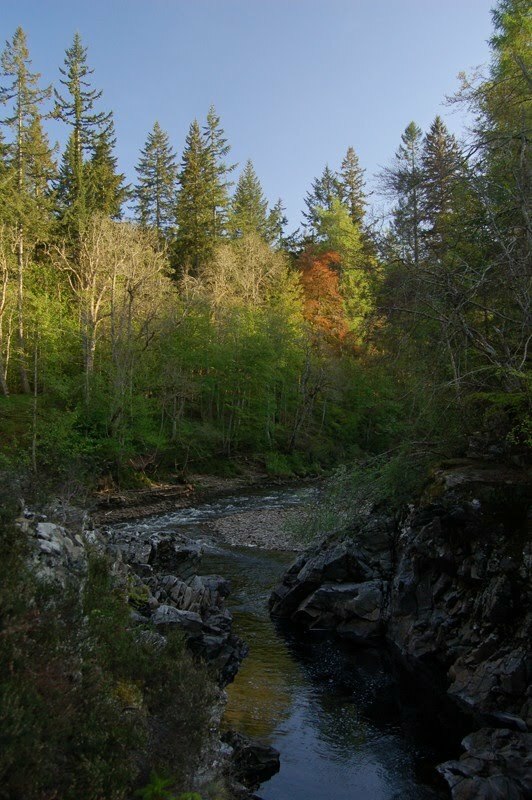 It is little known furth of the local area, but is enchanting in spring light. The walk upriver is beautiful, glimpses caught through the trees. I half expected a brown bear to appear and start dipping for salmon! 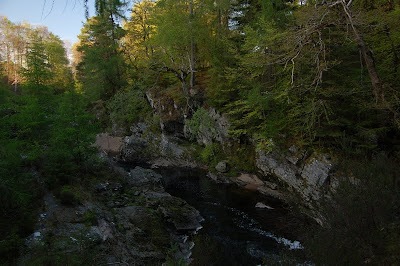 This is just one small section of the Findhorn. I would love to see more of this beautiful river. Good morning, let me introduce myself before you toss this leaflet straight into the recycling along with all the other election leaflets, flyers for fast food restaurants, etc. Pause a while and read, for you hold in your hand a communication of originality and vigour the proposals entailed within which I hope will persuade you to vote for the only candidate of true vision in this constituency, which also happens to have been my home for the past 15 years. Just 5 minutes of your time this morning could change history. It is well known that the main problems with the United Kingdom are the overheated economies of the South East. I propose a bold and simple solution to spread the heat around the country. Westminster Parliament will be moved to Meriden, in the centre of England, or perhaps Birmingham, which has better transport links and more hotels. The queen will also move from London, to Sunderland, which will experience a boom in tourism as tourists flock to Sunderland to see the queen. London will still have the financial industry, but the centres of power will be distributed more evenly which can only be a good thing all round. As for Scotland, the main problem is of course the Scourge of Sectarianism. The solution again has a couple of possible answers. The first is to merge Rangers and Celtic to form a single football team, Glasgow United. I don't know what colour you get when you merge red blue white and green, perhaps the strips of this new team should be brown. If this does not work, a great opportunity presents itself for Scottish independence. Like in Ireland, the sectarian part of the country - Glasgow - can be hived off so that - like Belfast - it is another country's problem. This seems to me to be the neatest solution to the thorny problem of sectarianism. Parliament will be moved from Edinburgh to Clackmannan, as we know how to run things properly here. Although these sort of arrangements are not within the remit of Clackmannanshire Council, for which I am standing in the by-election as an independent councillor, great ideas are great ideas no matter the soil they are planted in. Change must start somewhere. Indeed with this in mind I propose we set up a forum that looks at governments all round the world and takes the best bits from each. Off the tops of my head I imagine we will want to follow the example of Sweden, with more women in Parliament, and Australia, which has pioneered duvet days. But of course there will be many other examples my forum will discover. As far as global warming goes, the greatest threat to humanity yet, I sincerely believe you can't fight nature, she always wins in the end. Rather than creating complex schemes like carbon credits which don't work, I suggest instead growing vines and oranges, and avoiding building houses on flood plains - and if we do have to build houses on flood plains, then build them on stilts. This has the further benefit that if the climate ends up going the other way, and we get another ice age, the houses will be propped up and protected against permafrost. In fact now I think about it I believe all our houses should be on stilts, to protect against catastrophic climate change. Health, education, roads, bins, council tax - I have no policies as these subjects are boring, there are no votes in them. Sport and nutrition. School departments should be encouraged to hire attractive teachers of both sexes to take home economics and PE. If the teachers are good looking, then teenagers will obviously flock to their classes. If the good looking teachers in a school are say, maths teachers, they should be made to switch to Home Economics and PE. However maths teachers never are good looking so this is a moot point. People need to exercise more not just in schools, therefore all TV shown will be educational. This will bore people so much they will play sports instead. As a side benefit, if they decide to stay at home they will be well educated. It's a win-win. A short word on my opponents in this by-election. A trade-unionist, a community activist, and a former bank manager. A vote for any of these time-served re-treads - even one cast whimsically - is utterly wasted, when you have the rare opportunity to vote instead for a genuine poet. In one word I could say what these chimp-brained automatons could not with a thousand pictures. The mere fact that they wish office should suffice to disbar them from serious consideration: I shudder at the very thought of being involved in the bearpit of politics. If I am successful, I will have to be dragged - literally dragged - into office. Consider that. Thank you for reading my election leaflet. There are many, many more ideas and visions I have to bring to the table, but they will not fit on an A5 leaftlet, not even at 8pt Comic Sans. If you want to find them out, or require abilities and vision amongst your elected representatives, vote for me this coming May. The thing about our parliament? The truth's not quite self-evident. just ancient rite and sentiment. This clearly leads to discontent. who rhythm barred for an ideal.